Join TOPCA or Renew for 2019! COMMUNITY MEETING: Monday, March 25, 2019 @ 7:00 pm at Clarke Hall in Port Credit (Notice, in sidebar). Hosted by Ward 1 Councillor Stephen Dasko re: the 22-storey condo proposal (Edenshaw) at an assembled site on the Ann Street block north of Park Street East (see aerial context graphic further below). Planning staff will attend the Community Meeting. Edenshaw will present their plan. ALL WELCOME. 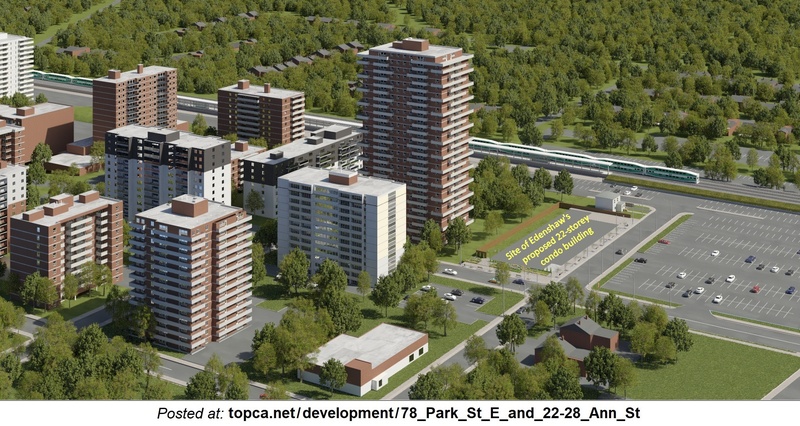 NOTE: TOPCA reps attended an overview presentation by the Edenshaw development team on March 13, 2019 to learn details of their draft proposal, in preparation for the Port Credit Community Meeting on March 25, 2019. The Ward 1 Councillor was also present. 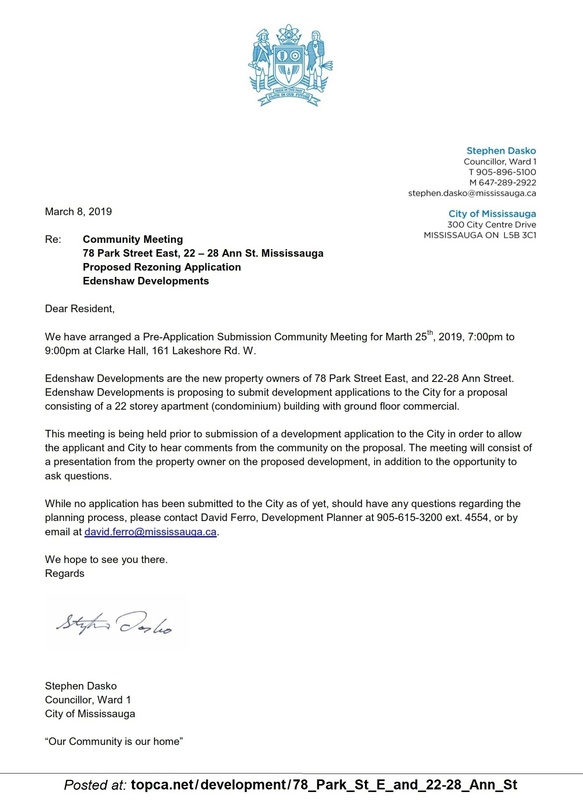 NEXT STEP: All public comments at the Community Meeting on March 25, 2019 will be recorded for an Information Report (along with all e-mails, etc. received from anyone in the community) which will be formally presented at a statutory Public Meeting (under the Planning Act) before the Planning and Development Committee (PDC) of Council. 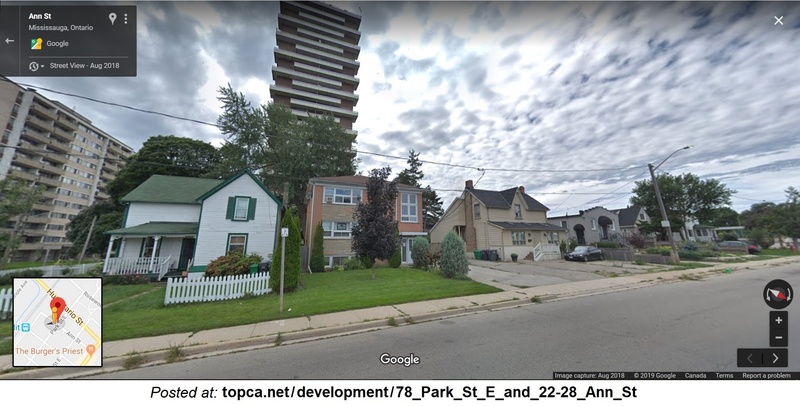 The proposed building site is the assemblage of five (5) lots along Ann Street (north of Park Street East) with existing single-family homes, which have all been approved for demolition at the City's Heritage Advisory Committee (HAC). Not included with the site is the house at 30 Ann Street, at the top of the block nearest the Port Credit GO Station (at Queen Street East). Concept image at left. ► View Edenshaw's site environs context photos dated: March 18, 2019 (5p PDF - slides). 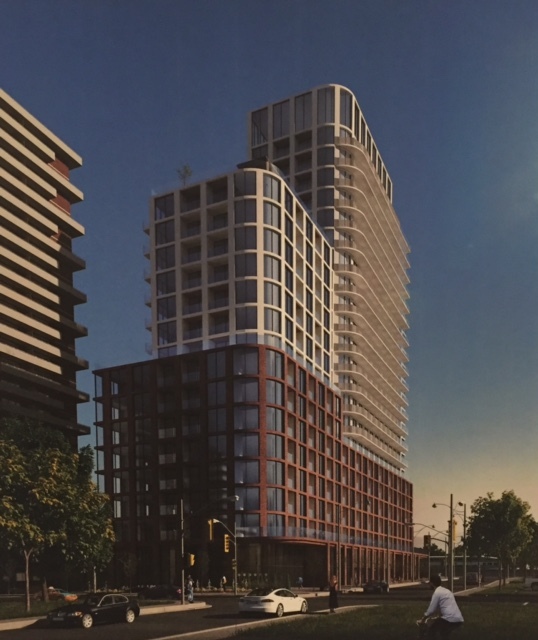 This is a long, narrow site, and the architect has indicated it was a challenge to design the 22-storey building within the constraints of the urban design guidelines and Official Plan policies in place. No Official Plan Amendment (OPA) is required, but a Zoning Bylaw change is required as the site is still zoned for 8 storeys. NOTE: The 'Century Park' building at 70 Park Street East (visible behind the block) is 27 storeys, but will look smaller due to lower ceilings in those units, per buildings of its era. The new building will be stepped to vary the height. 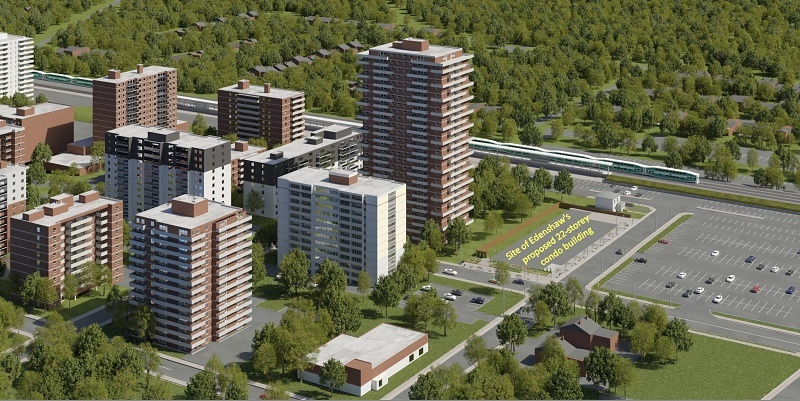 There are 350 units and 228 parking spaces (a ratio of .7 versus the standard of 1.1 - 1.2) in reflection of the building's proximity to the Port Credit mobility hub. The Port Credit Local Area Plan calls for 3000 square feet of commercial use on the ground floor, but there is question as to its viability / advisability in this location, away from mainstreet retail on Lakeshore Road. Edenshaw has not yet submitted their application to the City. The following image has been provided to TOPCA for posting in advance of the Community Meeting on March 25, 2019. 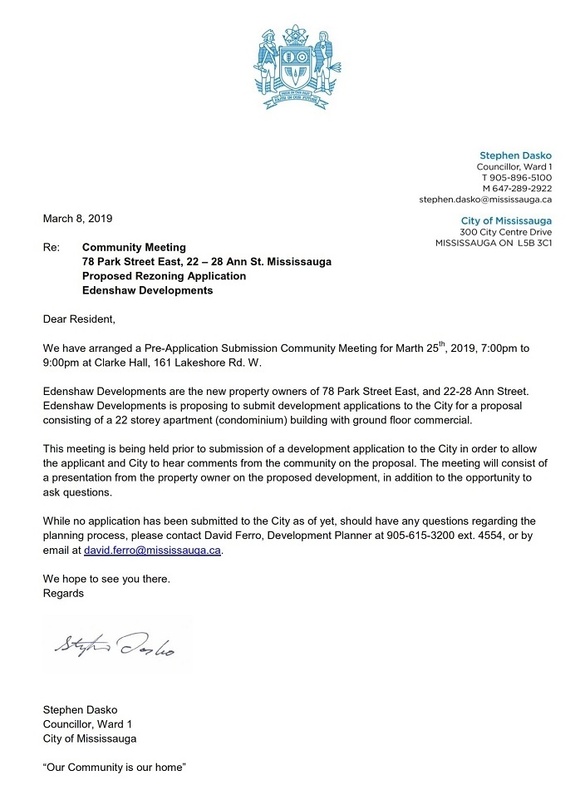 NOTE: While an image of the proposed 22-storey condo building was shown at the overview meeting, thus far we have not received it. We are told the design is under some revision. E-mail your comments to the City Planner of Record, David Ferro, and copy Ward 1 Councillor Stephen Dasko. Please consider copying the TOPCA Executive so that we can best represent the community's views when taking any formal position. Copyright © 2018 TOPCA - Town of Port Credit Association. All Rights Reserved.